Although it would not be uncommon for me to lose multiple objects on one trip, this time I only lost my iPhone. My own fault, for leaving it in my checked luggage instead of carrying it on. Lesson learned! This time, it was Augusta who ended up making a bathing suit donation. The correct answers to the next four questions — all true. Good job, gang. And now on to the rest of the questions. 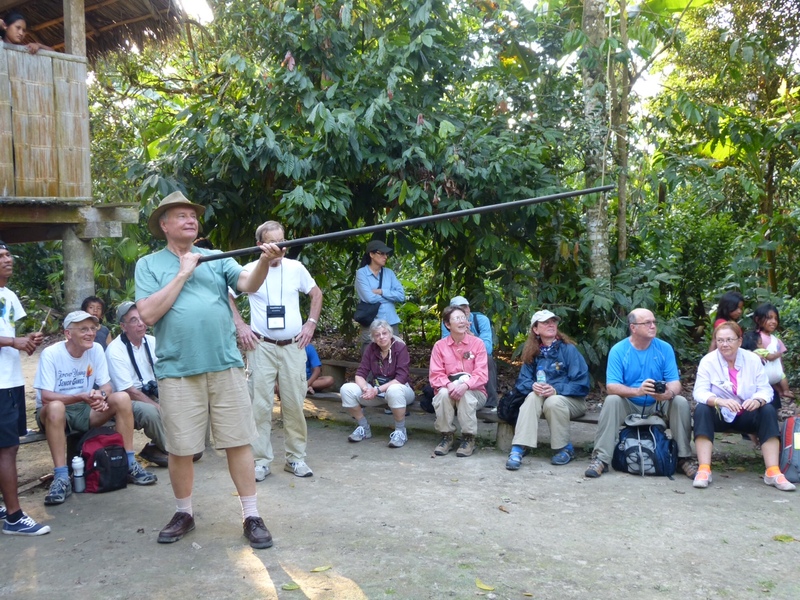 As for the blow gun contest, Mike was the star, demonstrating style and grace. thank you for believing that my Spanish could actually be understood. I may not know many palabras, but the ones I DO know are key–like where is the bathroom, where can I buy vino tinto, how much does it cost? Too bad I don’t like meatballs. That’s one sentence I learned that I never use! This next question was tricky. You all knew I wouldn’t be in the sun without hat, sun block etc, but it was Augusta, not Mike, that fell asleep in the sun and ended up with an interesting pattern on her neck. 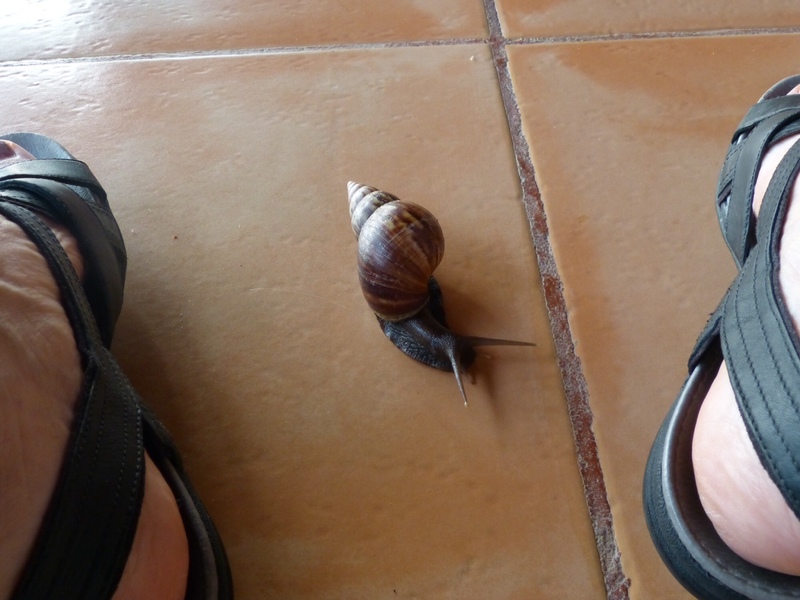 In the Amazon basin, the snails are huge. Not only are they a source of food, but their shell is used as a horn. Take a look at this fine specimen who appeared on our deck and wanted to make friends with me. His shell wasn’t the one that I tried to play-but I DID try with one of his relatives! We did NOT make beautiful music together. Lindy – 8 points. You were the only one that got the first question (iPhone) right. Fanny – 8 points. You got all of the people questions right. Lis – 7 points. You got an extra point for knowing that Augusta and I were BOTH floaters Sue -6 points. Hmmm, you don’t have faith in my Spanish abilities? Marion -4 points for getting all the true/false questions. The Internet connections continue to be a challenge…but not for much longer. an incredible journey/incredible woman. love your writing style and pics. I want to be just like you when I grow up. No more no less. Much love and thanks for allowing me to see so much beuty through your beutiful mind and eyes! And I have more…I just haven’t had a chance to post them. The next post will be especially for you, Tara and Steve.